Today, a significant part of the oceans remains coarsely mapped. Some specific areas like the continental shelves will require high-resolution surveys. This represents a very long and expensive task that will keep scientist busy for several decades. A way to reduce costs and time could be to improve the efficiency of current surveys. We are trying to do this by sending more signals in the water at the same time. The Multi-beam echo sounder is recognized as one of the most efficient and reliable tool for seabed mapping. 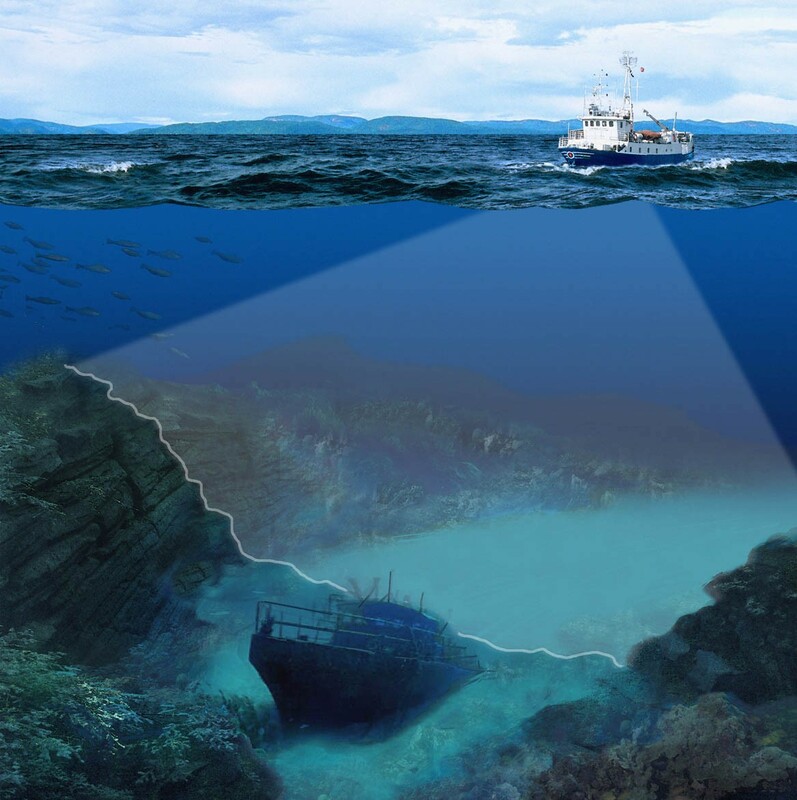 Applications range from regional mapping of the seabed for geological surveys to the inspection of man-made objects such as pipelines or ship wrecks. How does it work? A Multi-beam is composed of two orthogonal arrays. The sounder transmits a short ultrasound pulse (or ping) inside a wide angular sector steered vertically under the ship (see the illustration in Fig. 1). On reception, beamforming technique is applied in order to process the seafloor echoes inside a high number of narrow beams, providing depths of sounding along numerous angular directions. Usually, we put a limit on the minimum delay between two pings, since a new echo might mask the final part of the previous reflection. This system has mapped seabeds all over the world since its introduction in the 1980’s. The hardware has benefited from significant improvements in transducer technology and processing power. However, the fundamental design has not really changed for 40 years. Moreover, the simplest type of waveform, the unmodulated pulse, is still the one most used. In my PhD project, we are exploring with our industrial partner Kongsberg Maritime, new sonar designs that could lead to improved performance in some particular applications. One possibility is to transmit advanced coded waveforms, inspired from modern techniques used in radar and wireless communication. We show in Fig. 2, two examples of transmitted signals: The first one is the conventional “unmodulated” pulse, while the second has been “encoded” with a sequence of ones and zeros (the red line). In this example, additional information is added to the phase of the signal. It gives new properties to the pulse that may lead to various improvement, depending on the code and the desired application. Fig. 2: (Top) Conventional unmodulated signal transmitted for seabed mapping. (Bottom) Encoded signal, the red line corresponds to the code. By carefully choosing specific codes, we are trying to mitigate interferences between signals transmitted at the same time. Such a property is called orthogonality and it is very interesting for seabed mapping since it will make it possible to map multiple parts of the seabed at the same time. It may also increase the sounding density, and make the survey more efficient. Due to high cost at prototyping and testing new concepts, design investigations are performed with a simulator. It is based on FieldII (from DTU in Denmark) the reference in medical ultrasound simulation. The main advantage is the ability to model the wave-field emitted by all kinds of array geometries with arbitrary pulse shape. It computes the wave-field backscattered from a defined seafloor model. Data are generated at all the different processing stages, from raw data until the final depth of soundings. It allows us to study the effects of new designs on Multi-beam performance. 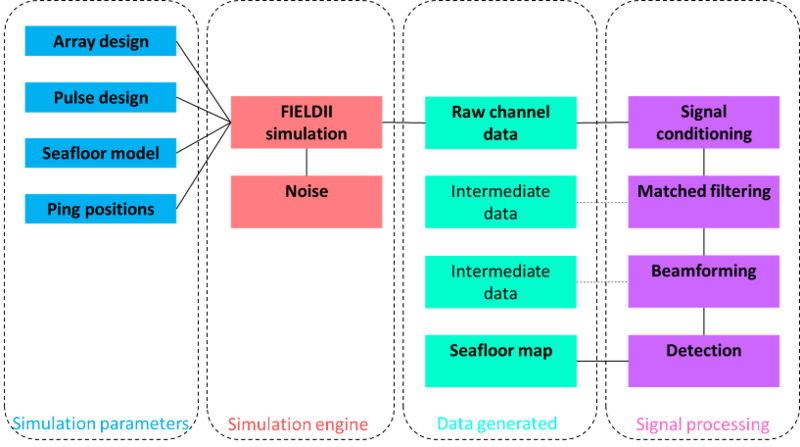 The simulation workflow is shown in Fig. 3. The last point that I would like to mention is the Doppler Effect: Unlike in medical imaging, the Doppler Effect is a source of trouble in seabed mapping. Rough ship motions induce frequency shifts in the transmitted pulse. The consequence will be the same as encoding with a chaotic sequence which is a function of the ship motion. If this sequence is unknown, it will corrupt the coded signal and destroy its properties. Therefore, we are working on signal processing techniques that estimate and correct these shifts. Once corrected, it will allow us to extend the boundaries of orthogonality between signals. Hopefully, this research project will open new possibilities for the next generation of Multi-beam echo sounders. Want to learn more about the Norwegian ultrasound research and business community? Ask a researcher: Can dead neurons grow again?